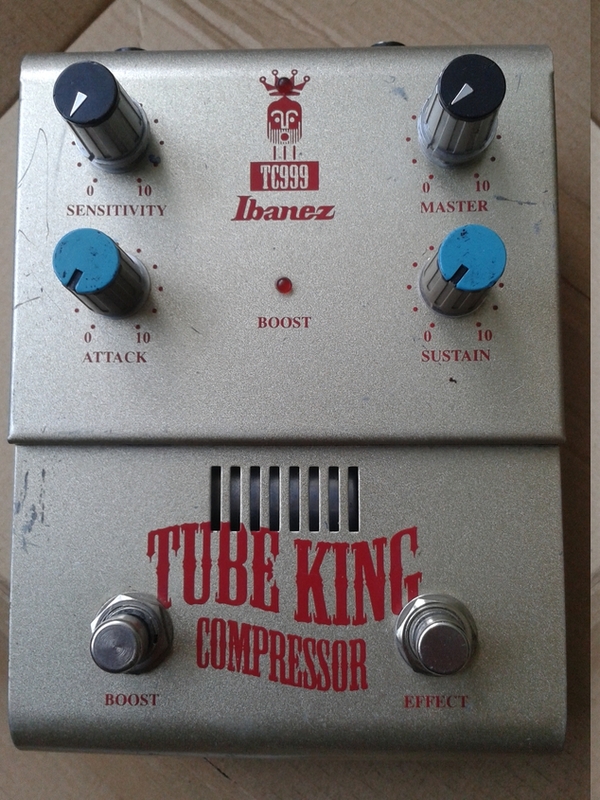 Ibanez TK999HT Tube King Distortion. Made in china, late 00’s. Not sure if the TK999HT is currently in production anymore. Ibanez site doesn’t list it and many european internet shops don’t have it on their listings. At least not any more. This high gain distortion is somewhat impressive by its appearance. The box is huge and heavy. The rubber pads on the bottom plate are something like 40mm in diameter, while the box itself measures 15x15x5 cm. Enclosure isn’t aluminium. As the features go, we have the usual drive/level controls, a three band EQ with low/mid/high controls and a presence switch. Since the amount of gain is very high, there’s also a “Void” control. This is your noise gate. 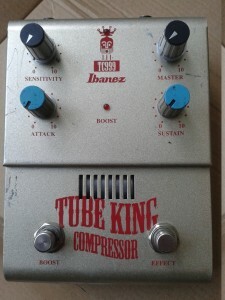 Other Ibanez boxes have had the same feature, name some high gain distortions from 7-series. 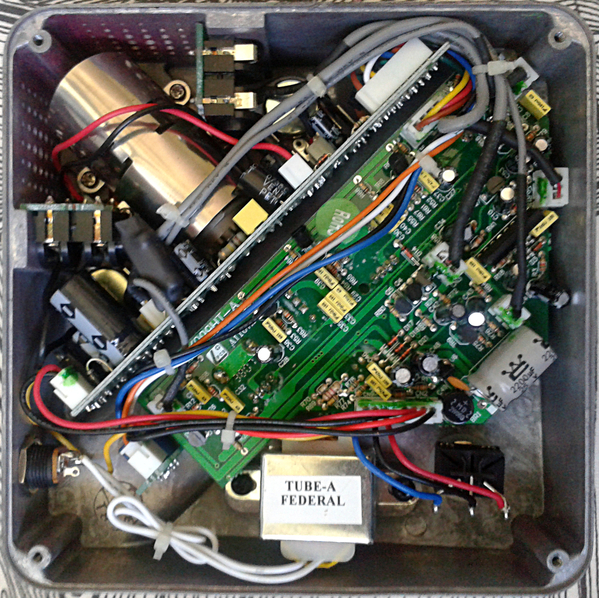 The box feeds itself on a 12V AC power supply and has its own transformer and rectifier diodfe bridge inside. In a sense, this configuration reminds me of those hybrid guitar amps that exploded in popularity in the 90s. 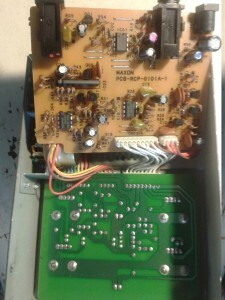 In fact, this comes pretty close, minus the output amplifier. Dirk Hendrik has drawn a schematic of this one too – here. 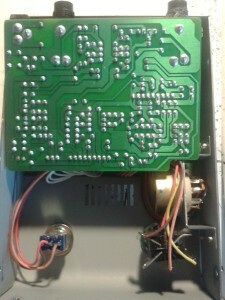 Even without the noise gate and power supply section, the design is taken one step further from the basic boxes we see more often. In essence, we have input buffering, followed by driver amp and gain control. After those there’s two tube driver stages, a buffer to decouple the tube. After that, there’s presence switch and tone controls. All three tone controls have their own cutting/boosting gyrators. Followed by output buffering. Void circuit in on mode, is attached in parallel with the effect circuit. Dirk’s schematic doesn’t disclose what’s the voltage being fed to the tube, but it sure isn’t the same 12V DC being fed to to rest of the circuit. Complex and somewhat impressive. 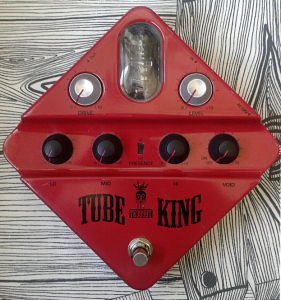 If i was to come up with one, biggest negative side to the design, it would definitely be the location of the tube. 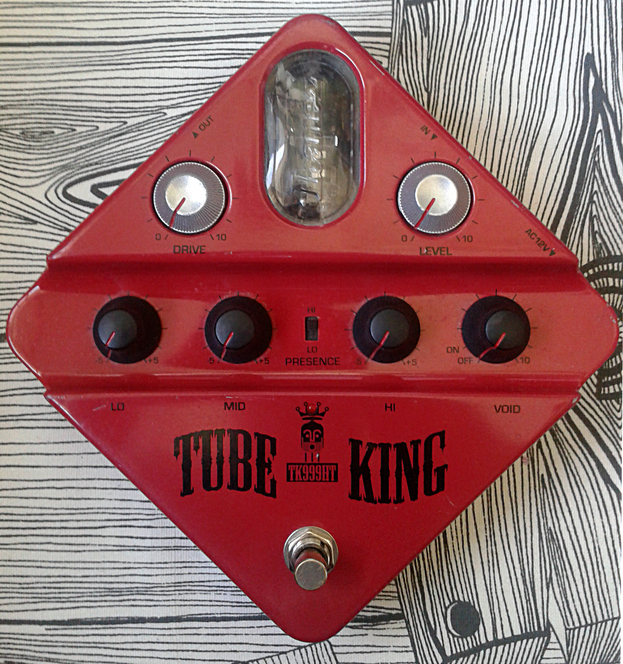 The ventilation is sufficient, but the previous Tube King boxes had the tube in plain sight, making it simple to swap for another type of tube if desired. This time the tube is placed so that it’ll require disassembling most of the insides to get to the tube. Somehow reminds me of older cars versus newer cars. One should be able to change the burned out headlamp by oneself. At least in my opinion. Modern High-Gain. Maybe slightly too modern and too high-gain for my personal taste. Due to amount of gain, the noise gate (or Void) is a good thing to have. While this may be a bit too much in distortion department, the output level is high enough to use the unit as a soaring lead monster. Due to it’s nature, i don’t see myself using this for base sounds on any set of settings. But as a solo distortion? Yup. In that scenario the pedals shines. And bright. Entries (RSS) and Comments (RSS). 37 queries in 0.183 seconds.